Slice-Of-Slim was to keep the joy of food alive for my husband. After a heart attack aged 50, he lost 4 1/2 stone (62lbs) on the WeightWatchers propoints plan. He is a changed man and his heart is repaired. 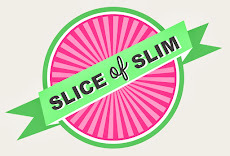 We are real food lovers, so I was determined that we wouldn't get bored of eating the same dishes all the time, hence Slice-of-Slim was born! (You can read more about how the blog began by clicking HERE). All my recipes are low fat, and because of our situation, I have drastically cut down on the amount of salt I use in my dishes. We love really tasty food so, although I still use low-salt soy and low-salt stock cubes, I try to use natural flavours as much as possible. There are some magic ingredients out there and by using natural flavourings you will achieve some wonderful results in your dishes. Obviously, flavours are very personal to your own preferences, so I'm showing you this paste but feel free to change proportions, add or subtract ingredients and see what you think. Many soups, curries or casseroles start their lives with a tasty paste. The three ingredients I use most in my kitchen are garlic, ginger and fresh red chillies. Don't be scared of red chillies. The larger ones tend to be less 'hot' and if you deseed them, a small amount can just add a subtle pungency to a dish without blowing your mouth off. Pop the garlic, chilli and ginger into a bowl. I felt like being 'chefy' and using a pestle and mortar (It's a great workout! ), but if you have a food processor or prefer to chop ingredients by hand, that's fine too. Just crush and pound the ingredients until a paste starts to form. Add the lemon juice and fresh herbs. The lemon will help to soften the other ingredients which makes it easier to pound them into a paste. I used my paste to stir fry some vegetarian prawns (Click HERE for info). It's a wonderful accompaniment to meat, fish, tofu and vegetables. You could even spread it onto a fillet of salmon before grilling.